Christmas is coming!! That means two things when it comes to books. First, you'll have a few days to treat yourself to a new read while you snuggle up by your twinkling Christmas tree lights. Second, you're making your list and checking it twice! Well, this book should be on it. Here's the blurb, and we'll chat on the other side! Jessica Ross’ scars run much deeper than the wounds of a world at war. Determined to escape the ghosts of her past and the German influence on her nightmares, she returns home to the sleepy Appalachian town of Hot Springs, NC, only to find the renowned Mountain Park Hotel has been converted into a ‘prison’ for displaced Germans and, much to Jessica’s dismay, her grandparents have befriended one of them. August Reinhold has not only found kinship with Jessica’s grandparents, but as they share their granddaughter’s letters from the Front, he discovers a surprising bond drawing him toward the independent and beautiful woman. Displaced by a war and a painful history, he find Hot Springs and the intriguing, Jessica Ross, a tempting place to start over. Determined to scale the heights of her bitterness and show her the power of love, August faces more than just Jessica’s resistance, but a more devious design to harm the civilian sailors housed in Hot Springs. Will August’s tender pursuit show Jessica the healing and hope she needs, or will bitterness force her into the hands of a ‘true’ enemy waiting to destroy much more than her heart? The Thorn Healer is the third and final in the "Penned in Time" series from Basham. However, if you haven't read the other two, you will easily be able to jump into this book as a stand-alone title. While you'll most likely return for the other two, starting here is fine. Basham has a way with words that suits her to this time period. Her characters are always well fleshed out, believable, and multi-layered--as are her plots. 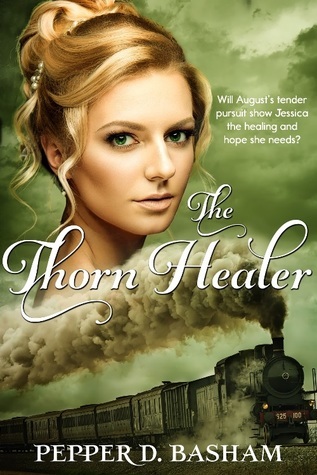 Her stories move at a pace that is neither rushed or stilted, and The Thorn Healer only reinforces this fact. I loved that in this book Basham didn't shy away from a tough subject like prejudice and that we were allowed to see a slice of history others may have overlooked. Basham is known for doing her research of both the time period and locale for her books, and it only enriches the story she weaves. If you're looking for a read for yourself or a friend, I highly recommend the entire "Penned in Time" series. You can purchase The Thorn Healer here or find out more info on the others.